Exercise-induced laryngeal obstruction (EILO) is a prevalent and yet still under-recognised cause of exertional breathlessness . The transient closure of the larynx, which develops during EILO, results in dyspnoea, cough, inspiratory wheeze (i.e. stridor) and tightness in the throat on physical exertion. It is estimated that EILO is present in 6% of adolescents and as many as one in four athletes with unexplained respiratory symptoms [1, 2]. Despite improved recognition over the past 5 years [3, 4], it remains frequently misdiagnosed and mistreated as asthma [2, 5]. The current “gold” standard investigation for the diagnosis of EILO is the continuous laryngoscopy during exercise test (CLE) . 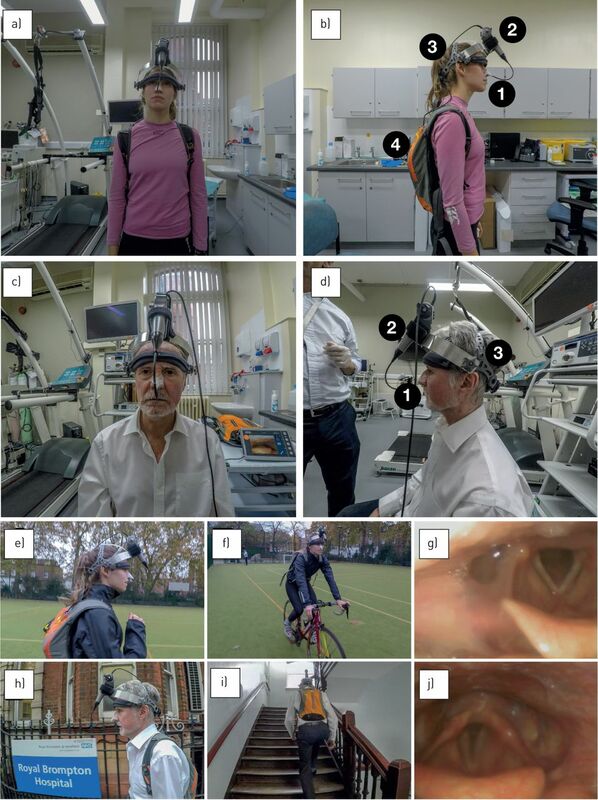 This test involves the placement of a flexible laryngoscope in the pharyngeal space that is then secured on headgear, to permit uninterrupted visualisation of laryngeal movement, during physical activity. The CLE test has now been performed in many thousands of cases worldwide and is a key step in providing robust diagnosis, but also in permitting characterisation of an individual's EILO, i.e. to differentiate glottic versus supraglottic level closure . The latter may dictate the choice of optimal management strategy, which can include surgical intervention in selected cases . The CLE procedure is well tolerated and has been performed across a wide range of patients, including in those aged under 10 years-old . However, as a consequence of the laboratory facilities needed, this important diagnostic test is currently still confined to a small number of specialist centres worldwide. This is despite the fact that laryngeal assessment is a routine part of Otolaryngology practice in most hospitals. Recent technological advances in laryngoscopic equipment have enabled visualisation of the larynx under more diverse physiological conditions, with reports of CLE testing being performed during indoor rowing  and while swimming in a resistance-pool . These testing scenarios more closely replicate the physiological challenges of test-specific activity and indeed many individuals report that their symptoms are only triggered on the exact replication of a sporting activity (e.g. track or hill running) or during competitive in the “field” exercise. In equine research, portable laryngeal equipment has been widely used in the investigation of exercise-related laryngeal problems as it allows stable image acquisition during free-range testing, under high intensity “real-world” racing conditions . We now describe the feasibility of a similar approach in humans; detailing the feasibility and stability for a portable means of “field-based” CLE testing. Using a portable battery-powered rhinolaryngoscopy system (CMOS laryngoscope and 8402ZX monitor; Karl Storz, Tuttlingen, Germany), weighing 1.2 kg, we performed laryngoscopy during running in an outdoor setting on two healthy subjects (author P.W., a 28-year-old female athlete with body mass index (BMI) 18.9 kg·m−2, and author S.W., a 60-year-old male with BMI 20.9 kg·m−2). The laryngoscope was placed in situ, following instillation of <2 mL of topical lidocaine gel applied to one naris. The control body of the laryngoscope was fastened to the subject's head using a light-weight specialist headgear. The flexible arm was secured to the nose using micropore surgical tape and the laryngoscopic video recorder was then secured in a backpack, worn by the subject (figure 1a, and video in the supplementary material). The subjects were then directed to perform to various forms of exercise, i.e. stair climbing, shuttle walking, running at a moderate pace and cycling (figure 1b and video in the supplementary material). a–d) Experimental setup for portable continuous laryngoscopy during exercise, shown in the two subjects. The subjects had a laryngoscope placed in situ and secured to the nose with surgical tape (1). The controller (2) was fastened to a specialist headgear (3). The recording unit was secured in a backpack (4). e–f) Portable continuous laryngoscopy in a 28-year-old female athlete e) running and f) cycling and in a 60-year-old male during h) shuttle walk and i) stair climbing. Laryngeal images recorded from the subjects are shown in panels g) and j). The images of laryngeal movement attained were stable and of high-quality; allowing precise characterisation of laryngeal movement. There was no adverse event during the trial, with scope placement and fixation taking under 10 min. The subjects found the setup was comfortable and did not impair ability to exercise in this real-world setting. The study thus successfully demonstrated the ability to perform “field-based” portable and continuous CLE testing. Laryngeal dysfunction is a prevalent cause of airway-centric (i.e. cough, wheeze and breathlessness) respiratory symptoms , and as such laryngeal closure disorders (often termed vocal cord dysfunction or paradoxical vocal fold motion and more recently inducible-laryngeal obstruction) often act to mimic asthma and cause diagnostic and therapeutic uncertainty. Establishing a secure diagnosis of laryngeal dysfunction is key step in facilitating the initiation of appropriate treatment and de-escalating inappropriate treatment . Laryngeal examination needs to be performed under “provoked” conditions, as examination in the resting clinical state is not sufficiently informative when investigating these symptoms and exercise or odour/perfume  exposure are key and relevant triggers or inducers. In summary, this brief report describes the feasibility of CLE testing in the “real-world” context of in the field provocation. Thus, potentially, enabling its performance in a clinic-based ambulatory setting, by both pulmonologists and otolaryngologists. Further work is now needed, in a prospective study with greater subject numbers, in order to further evaluate tolerability and to establish the validity and reliability of this mode of testing and provide comparator data with the current established standard technique of laboratory-based CLE testing. Author contributions: J.H.H. conceived the study, J.H.H., M.J.P. and E.S.W. performed the experiment. M.J.P. and C.M.O. produced the first draft of the paper to which all authors contributed, and all authors approved the final version. E.S.W. generated the figure and supplementary video file. Conflict of interest: J.H. Hull has nothing to disclose. Conflict of interest: E.S. Walsted has nothing to disclose. Conflict of interest: C.M. Orton has nothing to disclose. Conflict of interest: P. Williams has nothing to disclose. Conflict of interest: S. Ward has nothing to disclose. Conflict of interest: M.J. Pavitt has nothing to disclose. Prevalence of exercise-induced bronchoconstriction and exercise-induced laryngeal obstruction in a general adolescent population. Thorax 2015; 70: 57–63. Exercise-induced laryngeal obstruction: a common and overlooked cause of exertional breathlessness. Br J Gen Pract 2017; 66: e683–e685.
. Breathless athlete: exercise-induced laryngeal obstruction. Br J Sports Med 2018; 52: 1211–1212. Diagnosis of concomitant inducible laryngeal obstruction and asthma. Clin Exp Allergy 2018; 48: 1622–1630. Continuous laryngoscopy exercise test: a method for visualizing laryngeal dysfunction during exercise. Laryngoscope 2006; 116: 52–57. Supraglottoplasty as treatment of exercise induced laryngeal obstruction (EILO). Eur Arch Otorhinolaryngol 2016; 273: 945–951. Therapeutic laryngoscopy during exercise: A novel non-surgical therapy for refractory EILO. Pediatr Pulmonol 2016; 24: 445. Lesson of the month: Rowing-induced laryngeal obstruction: a novel cause of exertional dyspnoea: characterised by direct laryngoscopy. Thorax 2015; 70: 95–97. van van Someren K, et al. Laryngoscopy during swimming: A novel diagnostic technique to characterize swimming- induced laryngeal obstruction. Laryngoscope 2017; 127: 2298–2301.
. Exercising upper respiratory videoendoscopic findings of 50 competition draught horses with abnormal respiratory noise and/or poor performance. Equine Vet J 2018; 43: 3–8. Laryngeal Dysfunction - Assessment and Management for the Clinician. Am J Respir Crit Care Med 2016; 194: 1062–1072.
. Exercise-induced laryngeal obstruction—an overview. Immunol Allergy Clin North Am 2018; 38: 271–280. Continuous laryngoscopy during provocation in the assessment of inducible laryngeal obstruction. Laryngoscope 2018; in press [https://doi.org/10.1002/lary.27620].